"The Live Adventures Of Al Kooper And Mike Bloomfield"
This one was recorded at the Filmore West in 1968 and I think it is the first live performance with them. It's nice to hear a truly live album, warts and all. Like the liner notes say they're sometimes out of tune and time, but the electricity of the playing carries it through. The album consists of takes from 6 shows over three nights, with Bloomfield only making the first two. On the third day he was hospitalized and sedated to sleep after being up for five days or so. There's some good stuff here. Solid blues playing from Bloomfield and Kooper shows what he can do with a Hammond. For my money there's nothing like a B3. Nothing has ever come close to replicating it. There's a great cover of "59th Street Bridge Song". A rendition of "The Weight" with no vocals. And "Green Onions". But Bloomfield really shines on "Don't Put Your Love On Me So Strong". Pulling every note out of his very soul it's really a phd on blues guitar playing. For me the highlight of the album. Bloomfields absence on the third day was filled by the likes of Carlos Santana, Elvin Bishop and Steve Miller. Only Santana and Bishop are on the disc. Santana Plays straight blues on "Sonny Boy Williamson" and is right at home. I believe this performance was captured before he recorded with his band. All in all, some of the best Bloomfield I have heard. Now this is pretty damn cool. And funny. I like the double double black theme. This is a Black Widow high output. There's one luthier in my area in particular who loves these in traditional reverse zebra. The double cream V-59's for my guitar are done and installed. The Alnico 3's I put in them are nice but I think I might swap them for an Alnico 2 in the neck and a de-gaussed 5 in the bridge. This is what got me out of bed this morning. Hit and run in my own driveway. It's a nice way to start a Saturday. Oh well, I can get an early start on my day. I just finished reading "Mike Bloomfield - If You Love These Blues". It's his biography as told through interviews with Mike and the people who were around him. It starts from childhood to his death in 1981. There's a great discography in the back which I am working my way through. One of the things that struck me about Bloomfield was his attitude towards money and material things. It seemed to be a reaction to growing up fairly wealthy for the time, or perhaps a result of. He had an absolute disregard for things, to the point of abandoning cars when they quit and leaving his guitar behind in a bar. I can't imagine leaving my guitar behind. It's like a part of me. He suffered from chronic insomnia throughout his life which, according to some in the book, led to drug and alcohol abuse and ultimately to the overdose that took his life. The book is an excellent read and gives a great picture of the late 50's, early 60's Chicago blues scene. It also comes with a cd that has some rare tracks on it. Here's a couple to smooth us into the weekend. And now I am off to wind some pickups. Now that my seasonal employment has ended for another year I can focus on some pickup production. My V-59 wind is extremely popular so I plan on doing a few of those every week. I have a new vintage wind that has evolved over the past year or so. Three different outputs with the coil mis-match becoming larger with the higher output. I chose each combination to match the wind. Going over my notes these are the combinations that were the most common so I decided to make them part of the model line. I also have time to really work on my de-gaussing technique. Alnico 5 seems to work particularly well with a slight de-gauss. Alnico 3 is the weakest so I don't bother with that one and Alnico 2 is just too hit or miss. Too often it either doesn't make a difference or it's too weak. I think there is just too narrow a window for it to be truly effective. Seeing as it's Wednesday let's have a tune. How about some Howlin' Wolf? Hubert Sumlin, Wolf's guitarist, had a huge influence on Jimmy Page, Eric Clapton, Peter Green etc. Robert Plant borrowed a lot from Wolf as well, which isn't surprising as both Page and Plant were heavily into the Blues music that was coming over from the States at the time. This tune should sound vaguely familiar. It's "Killing Floor". Great guitar playing and smokin' tone. That's an R9 with original PAF's that he's playing. They've got real character: very smooth, lots of harmonic density and very open. I just ordered the most recent cd and I'm looking forward to that. This is a guy who's been playing since he was 12 or so. There's a documentary on him and most of it is on Youtube. This is just great tone on this clip. It's a cut from John Mayall's Bluesbreaker's "A Hard Road". Peter Green wrote this one and plays superbly. His guitar sounds as if it is crying. Gary Moore did a version of this one as well but I like the original. As a matter of fact the whole album is great. I got a hold of the re-mastered and extended version which has 22 extra tracks. I thought it was a great book, especially for the fan. There's a lot of background material on the guys before Zeppelin that I found very interesting. That's one of the real kicks I get, finding out where musicians came from before the point that I heard of them. After that it's a moment by moment, gig by gig, album by album history of the band. I found it very in-depth and well written, more so than the one by Peter Cole. I didn't agree with all the music criticism though. If I like a song, I like a song. I'm not sitting there thinking "That bass could have been recorded a little better" or "The vocals are too far back in the mix". I might be naive but I just figure that about 99% of the time that's just the way they wanted the song to be. I do agree that Page runs hot and cold and that towards the end of the 80's as his habits were really catching up to him that he ran more cold than hot, but there were still some great moments. All in all, a great read for the true Zeppelin afficionado. Great tone and great playing. It is hard to see if this is live or not. Right when they pan in at the beginning you can see the cords going offstage so it looks like they are plugged in. They don't seem to be synching as I haven't noticed any out of place moves. If it's live then they're having a good time. Peter is playing his '59 'burst which he later sold to Gary Moore. You can see quite clearly the difference in fade from the one Green is playing and the one Jeremy Spencer ( or it might be Danny Kirwan, I can't tell which) is playing. You know, the more I look at it the more I think that's Danny with the other burst. This post took three days to show up from Youtube, so I deleted the earlier one and kept this one. Let's have a great song to send us into the weekend. This is the first cut on the "Free Live" cd. Paul Kossoff is a straight into the amp kind of player and he gets outstanding tone on this song. Originally written by B. B. King you can't get much better than this. Thanks to Alistair for sending me this clip. This is his goldtop with a set of my P-90's. This is something I read about quite a while ago and tried it out on the spur of the moment. Basically you cook the magnets in an oven at 400 degrees or so for about an hour and a half. That's not hot enough to affect the strength of the magnet, I think that takes 1700 degrees or more, but it does even out the magnetic field. According to my magnetometer the field is nicely balanced out on the whole length of the magnet. I have seen this technique called "aging" but as I stated earlier it's not enough heat to have any effect on magnet strength. I have found slightly degaussing the magnet to be a better practise to achieve a killer tone. And speaking of tone, listen to this. After 26 years of playing I have finally been able to get a serious guitar. 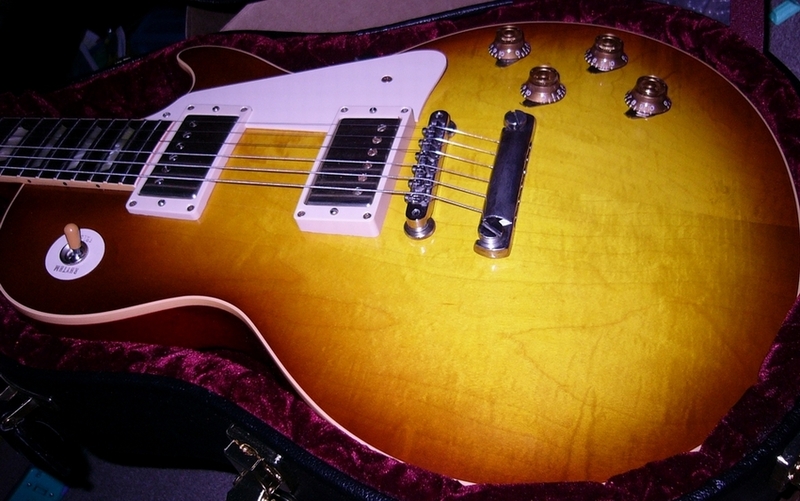 A 2006 VOS R8 from the Gibson Custom Shop. I love the smell of Nitrocellulose in the morning, it reminds me of Les Pauls. I purchased it off of E-bay from Guitarsofamerica. I've actually had it since October but I still get chills opening the case. I opted for the Ice Tea finish as I am not really partial to the cherry colour of the sunburst. I like them a little faded. The plain maple has just a hint of flame toward the edge. The sound of it is almost exactly what you hear on the Gibson site. I find the bridge pickup to be a little harsh in the top end, but I am going to replace them with my own. I think double cream bobbins.